Gallia Academy senior Jacob Campbell (4) breaks away from the Licking Valley defense during the first half of Saturday night’s Division IV, Region 15 quarterfinal at Jackson High School’s Alumni Stadium in Jackson, Ohio. JACKSON, Ohio — Unfortunately, the clock struck midnight. 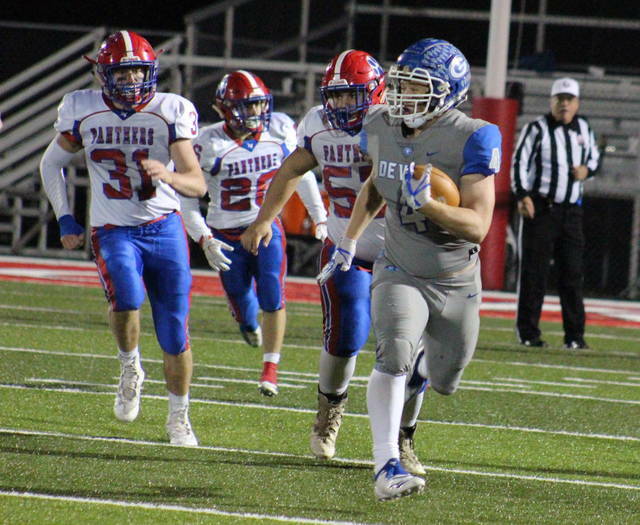 Gallia Academy’s fairy-tale 2018 football season came to an end on Saturday night during a 36-12 setback to seventh-seeded Licking Valley in a Division IV, Region 15 quarterfinal held at Jackson High School’s Alumni Stadium. The second-seeded Blue Devils (9-2) never led in the contest, but the Blue and White did manage to keep things close in the first half as the Panthers (8-3) were clinging to a slim 15-12 intermission advantage. The Blue and Red, however, fed Conner McLaughlin the ball in the second half — and the senior churned out 214 rushing yards and three scores on 15 attempts after the break. Those three scores proved to be the only points after halftime, allowing the guests to turn a three-point cushion into the final 24-point margin. The Panthers will play (3) Indian Valley next Saturday at 7 p.m. in the Region 15 semifinal at a yet-to-be-determined location. A complete recap of the Gallia Academy and Licking Valley contest will be available in the Tuesday sports editions of the Gallipolis Daily Tribune, Point Pleasant Register and The Daily Sentinel. LV: Connor McLaughlin 24-250, Chase Whisner 19-104, Mitchell Ford 1-20, Ethan Hile 1-10, Dylan Dodson 1-5, Carson Conley 1-1, Team 1-(-1), Devin McConnell 1-(-3). GA: Jacob Campbell 9-105, Lane Pullins 8-47, James Armstrong 2-16, Justin McClelland 11-2. LV: Chase Whisner 12-18-0 134, Connor McLaughlin 0-2-0 0, Mitchell Ford 0-1-1 0. GA: Justin McClelland 13-18-1 107. LV: Carson Conley 6-65, Ethan Hile 3-37, Connor McLaughlin 2-17, Mitchell Ford 1-15. GA: James Armstrong 6-53, Cory Call 5-37, Cade Roberts 1-9, Jacob Campbell 1-8.